The difference between taking a loan from public sector bank and a private bank is huge. The young generation always prefers private banks whereas our parents would always guide us to get it from a public sector bank. I would take an example of a home loan to compare the two types of banks since most of the terms and conditions remain same for all types of loan. We compare Private Sector Bank (E.g ICICI, HDFC, Citibank etc.) with Public Sector Bank (E.g. SBI, PNB etc.) to understand their loan policies. This fees is charged to analyse, evaluate and do the paperwork for your loan processing. Even though the bank is selling you the product, they don’t take this cost on them. Method 2: Percentage of the total loan amount (0.25% of the total loan amount). Most of the private sector bank depend on the their DSA (Direct selling agents) to get the loan consumer to their doorstep, they generally keep this fees high (like 0.50% – 1% ) to pay a cut of this fees to their agents. They are NOT aggressive in entertaining DSAs and hence have their processing fees generally low and starts from 0.25% or a fixed amount. So, approach them directly if you want to save some money. Better management and faster processing times than their counterparts. Their DSA’s have strict sales target every month and hence move faster to reach sales goals. They are NOT bothered about their performances most of the time. So, they move a lot slower but are steady in their process. Interest rates are increased by private bank as soon as RBI (Reserve bank of India) increases its REPO rate, but do NOT decrease with same speed at least for existing loan customers. The interest rate policies are more transparent in public sector banks than private banks. They keep same policies for all loan customers and decreased rate is effective for existing customers also almost immediately. Read the terms and conditions carefully, they DO NOT allow you to prepay the loan without the prepayment charges. Obviously, they are loosing interest money if they allow you to prepay. So, to mitigate the loss, they generally charge you 2% of the OUTSTANDING loan. Yes, I said OUTSTANDING. i.e. if you have an outstanding loan of 10 lakhs and you are making a pre- payment of 2 lakhs, you need to pay them 2% of 8 lakhs as pre-payment charges. That’s a whopping Rs. 16,000 penalty to reduce your loan by 2 lakhs. Public sector banks do NOT charge you a penny to prepay (read their terms and conditions). So, they score a plus point for me here. Normally, they add a clause that you cannot pre-pay ANY amount before completing 180 day (6 months) of your loan. Clever…because the EMI’s are designed in a way that the interest portion is maximum at initial stages of loan, this helps the bank earn maximum interest before you actually make any pre-payment. Good news: They do NOT have any such clause. You can start pre-paying from day 2 of loan itself. At-least I do not know of any bank which has a minimum period clause in this space. Another big plus towards public sector banks. They are too concerned about pre-payments as it is a loss of income. Generally, you cannot pre-pay more than 25% of outstanding loan in a single year. i.e. if you have taken a loan of 10 lakhs, you cannot pre-pay more than 2.5 lakhs in a single year. Again, no such clause here. You can pre-pay any amount which you like. This is helpful if you have got some lump sum amount from some other source of income and want to reduce your loan. Got the loan, but don’t come to branch. If you do, you will be charged for any transaction you do at their branch. Most of the private sector banks charge an amount of Rs. 100 plus tax for entertaining you at their branch after certain number of visits. They want you to use their ATM’s and online banking to transact. Off course, it saves their operations cost. No such policy here again. Visit them any number of times and they will be able to help you. 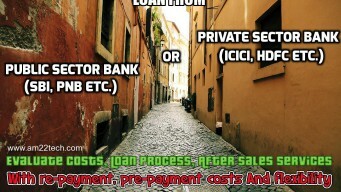 Choose Private Bank or Government bank for home Loan? After all, a loan is a product that the bank is selling to its customer i.e. you. They need to make profit out of it else, it does not make any sense to do business for them. But as a customer, you should try to buy a product whose cost is as low as possible in both short and long term. So, make a wise decision considering the above facts. There are lots of charges involved in a loan which are incurred at the beginning and over a period of time. Smaller tenure loans do not hurt much but for home loans, where the tenure is generally 20 years, you should take great care for the above mentioned points. For example, if you really want to close the loan much earlier than the actual loan tenure by making pre-payment occasionally, you should keep the pre-payment charges, period and amount in mind. I need a clarificantion regarding Axis bank SHUBH ARAMBH HOME LOAN scheme, where they waive off 4 no of EMI after completion of 4th, 8th & 12th year, provided EMIs are paid regularly on time. My question is where are they actually adjusting this WAIVED OFF amount.? I cannot help you with specific bank scheme. Please ask the bank for clarification. As per my opinion, SBI and PNB are better than others. Please ask the bank about which costs they have deducted. They will give it you in writing. govt banks will take ages to disperse loan. but they will also be able to catch property frauds,incorrect agrreemnets registed by builders and other fraudulent activities behind the scenes.